How to make amazake(fermented rice) pudding. 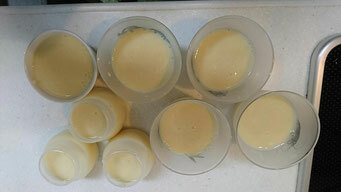 I posted making Amazake before so I would like to share an easy amazake sweets recipe with you ! The recipe in Japanese is the bottom of this blog. (1)Put amazake, soymilk (or milk), suger in a pot. (2)Heat it up when it begins to boil, turn off the heat then add gelatin and mix well. (3)Move to the container when it cools down preserve them in the fridge for 1hour.